Ireland and Leinster prop Mike Ross has confirmed that he will retire from rugby at the end of the current season. 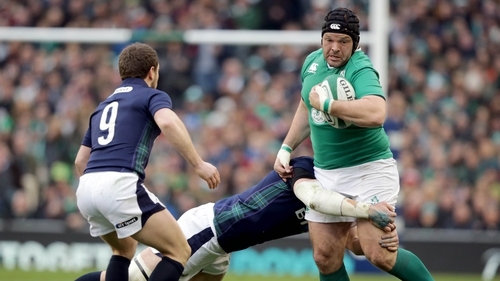 Ross will call time on a glittering career that has seen him win two Six Nations titles, represent Ireland at two World Cups as well as winning two Heineken Cups, a Challenge Cup and two PRO12 titles with Leinster. The 37-year-old Cork native has played on 61 occasions for Ireland since his debut in 2009 on the summer tour to Canada, while he has made a total of 151 appearances for Leinster since his debut in September 2009 against the Scarlets. Speaking to leinsterrugby.ie Ross said: "Rugby has been a huge part of my life and I've been incredibly lucky to have been a part of some amazing teams. In particular, I'll never forget winning the European Cup in 2011 or the Six Nations championship in 2014. "I never dreamed having had such a late start in the professional game that I'd go on to achieve such goals, or win 61 caps for Ireland. I'm indebted to my teammates and coaches, my friends and family. "My parents, Frank and Patricia, have been a constant backing and influence throughout my career, driving me to countless training sessions when I was young in Fermoy RFC and supporting me from the sideline through all kinds of weather playing with UCC and Cork Con! "I'd also like to acknowledge my friends and agents; Dave McHugh, Ryan Constable and Justin Paige for their guidance over my career. "I'd particularly like to pay tribute to my wife Kimberlee. Rugby can be very tough on a family, as I'd often be gone for months on end which is hard when you've two young kids, but she's been an endless source of support and strength. "I'll miss the camaraderie of the dressing room and the roar of the fans when running out in the RDS Arena or in the Aviva Stadium, but unfortunately you can't play forever. It's time to go in a different direction and I'm stepping out of the rugby bubble and moving into the fast growing world of technology." Paying tribute to Ross, Leinster head coach Leo Cullen added: "Mike has played such a major role in Leinster's successes since he joined from Harlequins in 2009. "He was at the very heart of Leinster's famous comeback against Northampton in the 2011 European Cup Final with a brilliant second-half scrummaging display that helped turn the tide of momentum. "And the following season he played a huge role once again as the Leinster scrum pushed (European Cup final opponents) Ulster off their own ball in the first-half that led to a try. "Mike has also been a great mentor to some of our younger props, always being prepared to pass on his experience to ensure their continued development."